Whenever I get a chance to go to the beach I always tend to sit and scrub my body with the sand because it is a naturally rich ingredient that acts as a scrub and really smoothens your skin. Doing this every time I hit the beach really gave me smooth and radiant skin. So one of the ladies who works in the salon I often go to told me to use this Thai based spa salt to help whiten and smoothen my skin. I gave this product a try and I swear my skin felt like never before. I felt like a baby again. This product is for skin whitening and it is enriched with vitamin E. Ideal for bikini and armpit areas. The product label tells you to rub the product directly to your body in circular motion but I don’t really do that. What I do is I get a bowl that contains a small amount of olive oil and then mix quarter of the product with it until it turns into paste. I use this in the shower after I am done shampooing. I scrub my whole body with it and then leave it for 3-5 minutes until I can rinse it off. Trust me you will thank me for this!! It will leave your skin smooth, radiant, and baby like. I usually buy this at Giant supermarket all around the UAE and it costs around Dhs 3. Super cheap!! I was looking for articles on spa in Dubai and I came across yours inspiring read. 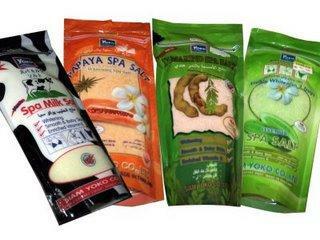 Though you topic was not exactly based on spa but it definitely highlighted some the spa treatment products.